Left – Right: Mr. Himanshu Baid, Chairman, (Medical Technology Division), CII; Mr. Madan Krishnan, Chairman, AdvaMed; Mr. Probir Das, Senior Vice President, Healthcare Federation of India (NATHEALTH); Mr. Badhri Iyengar, Chairman of FICCI’s Medical Devices & Equipment Committee; Mr. Diwaker Rana, Co-Chairman MTaI Medtekon; HE Klas Molin, Ambassaor of Sweden to India; Dr. VK Paul, Member, NITI Aayog; Dr. Teodoro J. Herbosa, Executive Vice President, University of Philippines; Mr. Pavan Choudary, MTaI Chairman and Director General; Mr. Prabal Chakraborty, Chairman (Medical Device Committee, American Chamber of Commerce in India, unveiling a Theme Paper entitled ‘MedTech: The Keystone for Ayushman Bharat’. New Delhi: Leading industry bodies representing medical technology sector on 20th September came together at MTaI MedTekon 2018 to discuss ways to strengthen healthcare delivery under Ayushman Bharat scheme, a government programme to enable the bottom 40 percent of India’s population access healthcare for free. Representatives of Medical Technology Association of India (MTaI), Advance Medical Technology Association (AdvaMed), AmCham Medical Devices Committee, Confederation of Indian Industries (CII), Healthcare Federation of India (NATHEALTH) and Federation of Indian Chambers of Commerce and Industries (FICCI), underscoring their solidarity, huddled up with government officials, doctors, investors and patients’ groups to chalk out a roadmap for the industry to contribute effectively to the world’s largest healthcare reform programme. Starting 25th September 2018, the government plans to provide health insurance to 10 crore families and also strengthen the network of primary health centers in the country. Most secondary and tertiary treatments will be covered under the scheme. As per statistics, health insurance has spread only to 27 percent of the population-the cover being sparse-and more than 80 percent of healthcare expenditure is incurred by individuals from their own pockets. “We admire the vision of inclusion behind Ayushman Bharat and the programme’s massive scale. It has the ability to stimulate the economy due to its impact on the health of the labor force as well as provide a new ecosystem in healthcare business which can sprout a thousand new ladders of commercial success.” MTaI Chairman Mr. Pavan Choudary said. For the scheme, the government has recommended maximum allowable costing for 1363 health procedures. Mr. Probir Das, Senior Vice President, Healthcare Federation of India (NATHEALTH), said: “The cost structure still needs work. While for many procedures the cost may be optimum, for several, it may require a re-think. The ideal way to resolve this problem will be to keep the cost of medical devices outside the procedure costs. Also, given the fact that international MedTech companies use their global network to train physicians and develop modern therapies in India, they should be considered as a vital pillar for consultation and programme development”. Mr Badhri Iyengar, Chairman of FICCI’s Medical Devices & Equipment Committee, said: “Medical devices and diagnostic services are very important in health treatments. By the virtue of this, we feel that the medical technology industry is an important stakeholder for Ayushman Bharat. We are committed to contributing in letter and spirit to the successful implementation of the pathbreaking scheme. Today’s deliberations have been important in paving the way for this”. “The Ayushman Bharat Scheme will significantly bring down the out of pocket healthcare expenses and have an indirect impact on individual wealth which will lead to economic growth of the nation. The other longer term and most important impact of the scheme will be the data repository through AB-NHPM, it will facilitate research and evidence-based decision making in future.” added Mr Himanshu Baid, Chairman of Medical technology Division, CII. Dr Paul urged the international fraternity to suggest how they can contribute to Ayushman Bharat scheme. “The international fraternity can help us strengthen the scheme going forward. They have a strong R&D, can bring investments for Make in India, set up health and wellness centres through their CSR centers and train healthcare professionals. I would like to ask the fraternity to come up with ideas on how they can contribute to the scheme,” he added. 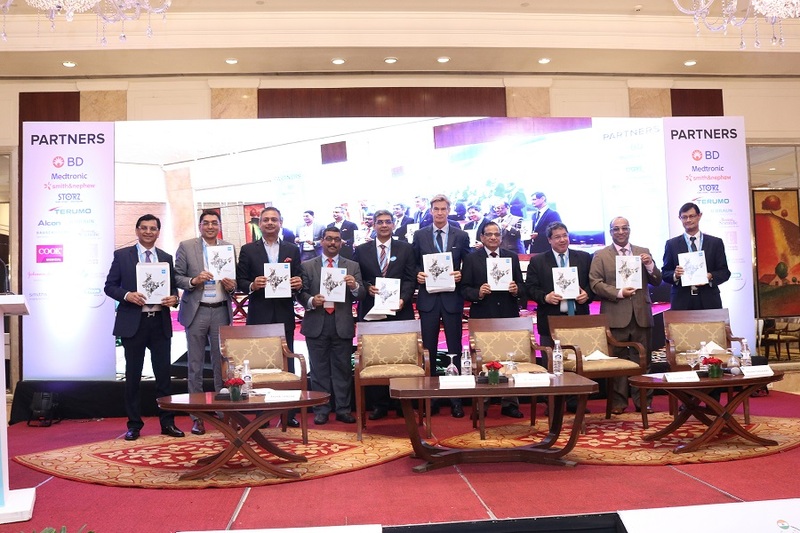 During the summit, MTaI unveiled a theme paper entitled ‘MedTech – The Keystone for Ayushman Bharat’. The paper presents Ayushman Bharat scheme in summary and points out the concerns of stakeholders which need to be dovetailed to ensure success. The theme paper also brings out the possible solution to these concerns. “For the success of the Ayushman Bharat programme, it will require the coordinated action of all stakeholders in the complex healthcare industry including health insurers and TPAs, providers, the pharmaceutical industry, the medical device & diagnostic industryAyushman Bharat has the potential to transform the perception of the Indian public towards government healthcare schemes. It will be no small feat to achieve the core objectives that it has set for itself and if the scheme is implemented in a methodical, systematic and well researched manner, the Healthcare landscape shall truly be transformed.” the paper states.